Such must be the fate of small metal labels that they are destined to uncover talent, taking a risk on unknown young bands, only to see them graduate to bigger and better things. Cruz del Sur nurtured While Heaven Wept before Virginian doomsters signed with Nuclear Blast, only to score Pennsylvanians Argus after Shadow Kingdom Records gave the latter a chance first. With only a second full-length album into their career Argus has arrived and looks like a force to be reckoned with … probably only to move higher up the ladder when the opportunity strikes. Boldly Stride the Doomed is bookended by a pair of acoustic instrumentals flowing as if from the same root. The Ruins of Ouroboros is a bit more developed compositionally, but the way these instrumentals are cleverly positioned, you are almost enticed to give the album multiple listens, to play it in the non-stop loop. In between this frame, Argus presents an interesting combination of darker shade power metal and traditional doom without picking favorites between the two. 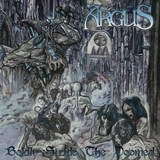 If I was looking for a new term for this style, I would call it an American doom, seeing how Argus carefully avoid any of the gothic, symphonic or chamber music instrumental (violin/cello) touches so prevalent from some of the most famous European doom bands. Argus music is less about melancholy, but more about the muscled riff, yet the feeling of doom is still pervasive. Argus can take a tremolo and resolve its clamoring urgency into a dark doomy gallop with ever increasing heaviness (A Curse on the World, title track). Melodic bits throughout, active, sometimes even overly, bass lines, guitar solos ranging from meandering to progressive, the album is a very engaging listen, constantly migrating between power and doom, not settling for either. Wolves of Dusk opens up with a riff which could make both Iron Maiden and Candlemass proud. Durendal is a rousing march to battle, also giving eulogy to the warriors already passed or those who are about to pay the ultimate price, the heroes making one final stand. Uptempo, these cuts contrast mightily with the torturous Solitude Aeternus slow bent notes and melodic vignettes of The Ladder or the constant Trouble-like riff pressure of Fading Silver Light. 42-7-29 with its piano touches and rumbling bells stumbles hopelessly to its final destination, while epic Pieces of Your Smile takes a few minutes to get going, but after it does it will provide the glimpse of some of the most heartfelt melodic doom bringing this journey into its final crescendo. Just like they skillfully navigate between the two genres, Argus continuously manages to find its comfort zones. The guitars, while often engaging in lengthy explorations, never make a progressive mockery of themselves. Not for the doom purists, Boldly Stride the Doomed is also not copycat Maiden worship or 90s noodling NWOBHM. The feeling of harmony is one of Argus’ strong suites, the vocals of Butch Balich (formerly of Penance) gliding alongside the riffs pushing an occasional high note. While Shadow Kingdom would have been a good fitting home for Argus, it is obvious that Cruz del Sur can open more doors and horizons for the band. It seems that the partnership is going to be productive resulting from an obvious fit.